In today’s era of instant communication, it’s hard to imagine a time when people relied on printing presses, the US Postal Service, and newspapers hawked on street corners to distribute information and calls to action. Unlike 21st century organizers of political action, activists in the 1960s and ‘70s relied on technology such as mimeograph machines and press type. Their medium was the printed word. Iowa City was a hotbed of protest—and a hotbed of printing. Radical groups and individuals wrote newsletters and manifestos, printed fliers to post around town, and published literary magazines. Many of their newspapers were circulated nationally, creating space for local activists to engage with national conversations challenging the status quo. 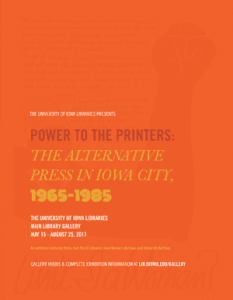 The publications in this exhibition document many strands of protest in Iowa City: the anti-war movement, Chicana and Chicano liberation, feminism, black power, gay and lesbian rights. Visitors will see just a sample of Iowa City’s activism, drawn from extensive collections in the University Archives and the Iowa Women’s Archives. Ain’t I a Woman 1:1 (June 26, 1970), Sondra Smith papers, box 1, Iowa Women’s Archives (IWA). Ain’t I a Woman 1:2 (June 10, 1970), Ain’t I a Woman (AIAW), box 2, IWA. Ain’t I a Woman 2:2 (August 27, 1971). AIAW, box 2, IWA. Ain’t I a Woman 3 (February 1973). AIAW, box 2, IWA. Handwritten page from Dale McCormick’s AIAW notebook, 1971-1973. Dale McCormick papers, box 2, IWA. Typed page from Dale McCormick’s AIAW notebook. Dale McCormick papers, box 2, IWA. Ain’t I a Woman/No Soy Una Mujer 4:2 (May 1974). AIAW, box 2, IWA. All Women are Welcome to Read Their Poetry, Jo Rabenold papers, box 1, IWA. The Common Woman #1 (Winter 1973), Adelaide “Dee” Morris papers, IWA. All Women are Welcome to Read Their Poetry, Linda Yanney papers, box 1, IWA. Because Mourning Sickness is a Staple in My Country, Dale McCormick papers, box 2, IWA. Greasy Thumb Automechanics Manual for Women, by Barb Wyatt and Julie Zolot (Iowa City Women’s Press, 1976), Karla Miller and Jean Bott papers, box 1, IWA. Greasy Thumb page layout, p. 186, Iowa City Women’s Press (ICWP) records, box 2, IWA. Greasy Thumb page layout, p. 161, ICWP records, box 2, IWA. Against the Grain: A Carpentry Manual for Women by Dale McCormick (ICWP, 1977), Morris papers, IWA. Skills manuals for women ad layout, ICWP records, box 2, IWA. Thumbprint for Greasy Thumb, ICWP records, box 2, IWA. The Story of the Itsy-Bit, by Anna and Agnes Carbrey, (ICWP, 1975), ICWP records, box 3, IWA. Mothers: A Photography Exhibit of Our Own, ed. Barbara Ettleson, ICWP records, box 3, IWA. Poster for “Mothers: A Photography Exhibit of Our Own,” Women’s Resource and Action Center (WRAC) records, IWA. Iowa City Women’s Press ier, ICWP records, box 1, IWA. Sign for Iowa City Women’s Press & Annie Graham, ICWP records, box 8, IWA. Spinster: A Lighthearted Card Game, ICWP records, box 6, IWA. Words of a Woman Who Breathes Fire, by Kitty Tsui (ICWP, 1983), ICWP records, box 5, IWA. shadow on a tightrope: writings by women on fat oppression, ed. Lisa Schoen elder and Barb Wieser (ICWP, 1983), ICWP records, box 4, IWA. Black Lesbians, comp. J. R. Roberts. (ICWP, 1981), ICWP records, box 4, IWA. Sinister Wisdom 21 (Fall 1982), ICWP records, box 5, IWA. Sinister Wisdom 24 (Fall 1983), ICWP records, box 5, IWA. Emma’s Periodical Rag (March 1980), Emma Goldman Clinic records, box 53, IWA. Snapshots of women working at Iowa City Women’s Press, ICWP records, box 1, IWA. Women’s Wheels, by Deborah Linc (ICWP, 1982), ICWP records, box 4, IWA. Women’s Resource and Action Center (WRAC) Newsletter 4:1 (October 1977), WRAC records, box 23, IWA. Paste-up of WRAC 10th anniversary logo, Women’s Resource and Action Center (WRAC) records, IWA. WRAC Newsletter 4:1 (October 1977), WRAC records, box 23, IWA. Grace and Rubies baseball cap, Kimela Nelson papers, box 3, IWA. Ad for Grace and Rubies women’s restaurant, WRAC Newsletter 2:3 (November 1975), University Archives (UA). Softball. Loaned by Kären Mason. Better Homes and Dykes 6: 2 (April 1980), Jo Rabenold papers, box 4, IWA. Better Homes and Dykes (Summer 1976), Jo Rabenold papers, box 3, IWA. Better Homes and Dykes #1 (1974), Jo Rabenold papers, box 3, IWA. Common Lives/Lesbian Lives #6, Common Lives/Lesbian Lives records, IWA. Common Lives/Lesbian Lives #5, Common Lives/Lesbian Lives records, IWA. Common Lives/Lesbian Lives #1, Common Lives/Lesbian Lives records, IWA. Cover of Common Lives/Lesbian Lives #8 (Summer 1983), Common Lives/Lesbian Lives records, IWA. Common Lives/Lesbian Lives #22, Common Lives/Lesbian Lives records, IWA. Denim Jacket and buttons, on loan from David McCartney. Political buttons, Iowa Women’s Archives. No More War, Emil Rinderspacher Papers, RG02.0009.030, University Archives. Protest Mask, Emil Rinderspacher Papers, RG02.0009.030, University Archives. Petitions signed in blood, Antiwar Petitions Collection, RG 02 .0006.002, University Archives. El Nahuatzen (1979), Student-Produced Publications and Newsletters Collection, RG 02.0005.001, University Archives. RFD (Rustic Fairy Dreams) (Autumn 1974), Jo Rabenold papers, box 3, IWA. Nahuatzen (4:1), Nancy “Rusty” Barcelo papers, box 8, IWA. Nahuatzen (2:1), Nancy “Rusty” Barcelo papers, box 8, IWA. Middle Earth, Robert Sayre Papers, Accession 2014-43, University Archives. Pamoja (Summer 1977), Student-Produced Publications and Newsletters Collection, RG 02.0005.001, University Archives. Pamoja (May 1980), Student-Produced Publications and Newsletters Collection, RG 02.0005.001, University Archives. Fliers: Vietnam Moratorium (x2), A Brand New Day, Student Handbook, Student Fliers & Handouts, RG 02.0004.001, University Archives. It’s About Time, Iowa City Center for Men, Student-Produced Publications and Newsletters Collection, RG 02.0005.001, University Archives. Typewriters loaned by Jennifer Burek-Pierce, Rhoda McCartney, Jodi Scholl, and Nicholas Theisen. Ditto machine loaned by Rich Dana.